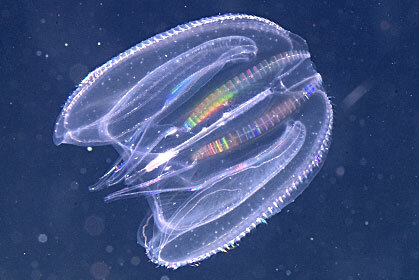 The sea walnut is a ctenophora that is closely related to jellyfish but lacks tentacles and nematocysts. It grows to be 6cm long and 10cm wide. It has wart-like bumps on its body and is capable of bio-luminescence. They eat fish eggs, larva, kilka, anchovies, zooplankton and horse mackerel. Mucus covered lobes are used as a means of catching food. They are hermaphroditic and reproduce asexually when environmental conditions are poor. With plenty of food and the correct water temperature, the sea walnut will spawn with other individuals. Eastern shores of the U.S. to the West Indies. It is invasive to the Eurasian waters of the Mediterranean, Black Sea, Caspian Sea and the Sea of Marmara. They inhabit the photic region and can be found the littoral zone. No conservation efforts are in place for the sea walnut because they are considered an invasive species. They have no particular importance to humans. Dunning, Page. "Mnemiopsis leidyi". Animal Diversity Web. Retrieved from: http://animaldiversity.ummz.umich.edu/accounts/Mnemiopsis_leidyi/.